The fact that silicon chips start life as nothing more exotic than sand is amazing enough, but have you ever thought about that other important PC component, the hard disk? Its origins couldn't be more different. The heart of a hard disk – the rotating platter where your data is stored – is made out of an exotic mix of elements including ruthenium and platinum, two of the world's rarest and most expensive metals. Needless to say, this statement doesn't even hint at the complexity involved in transforming rare ores into gigabytes of data storage. The hard disk's high speeds of rotation and the close proximity of the head to the platter means that the processes must be carried out with the ultimate in precision and cleanliness. Add to this the strange properties of magnetic media and the techniques required to achieve the optimum capacity, and the story of how disks are made becomes one that encompasses the fields of mining, metallurgy, chemistry, physics and involves the pinnacle of engineering and manufacturing technology. 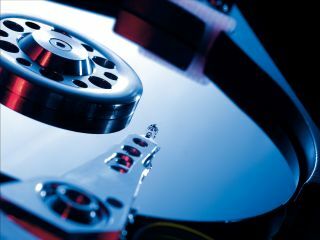 As a whole, a hard disk is an amazing feat of electronic and mechanical engineering, but two parts – the heads and the platter – stand out for their sheer manufacturing complexity. As the part that actually stores the data, the platter is what many people consider the heart of a hard disk drive – and here we reveal the secrets of its manufacture. Platinum is only the 70th most abundant element in the Earth's crust, making up just three parts per billion. Ruthenium comes two places lower with an abundance of only one part per billion. By way of comparison, silicon – the raw material from which microprocessors are made – accounts for around 27 per cent of the Earth's crust. It's no surprise then that platinum is hugely expensive – today's market price is more than $1,300 per Troy ounce. Turning to ruthenium, the total annual production is just 27 tonnes, an amount that would fit in a 1.3m3 cube. Both are mined predominantly in South Africa. Platinum is one of the noble metals, which means that it's relatively unreactive. Unlike metals such as copper – the main ores of which are compounds – platinum is normally found in its metallic form. This doesn't mean that extracting it from its ore is simple, though, as platinum is normally found mixed with other metals. Obtaining pure platinum involves separating it from the iron, copper, gold, nickel, iridium, palladium, rhodium, ruthenium and osmium that it's invariably found with. Let's just say it's a complicated multistage chemical process that can take up to six months to complete. Fortuitously, though, the ruthenium that's also needed in disk manufacture is a by-product of the process. A deep mine in the Bushveld Complex of South Africa might seem far-removed from a finished hard disk, and in this sense it's an ideal place to start our investigation. But we're not going to need the platinum or the ruthenium until well down the line, so for now we'll put them aside as we move to something more down to earth – and considerably more common. The manufacture of a hard disk platter starts with the fabrication of aluminium blanks, which are disks of aluminium alloy onto which the magnetic recording layer will eventually be deposited. High-purity alloy that contains four to five per cent magnesium plus small amounts of silicon, copper, iron and zinc to give it the necessary properties is cast into an ingot weighing seven tonnes. The ingot is then heat-treated, hot-rolled and cold-rolled in multiple passes to provide a sheet of the necessary thickness (usually 0.635mm, 0.8mm, 1.0mm, 1.27mm, 1.5mm or 1.8 mm – just enough to provide adequate stability while rotating at high speed) from which the blanks will be punched. Punching takes place once the alloy sheet has been coiled into large rolls so that a single stamping process produces lots of blanks. This is then followed by a stacked annealing process to reflatten the blanks. Finally the blanks are ground to a high level of precision to achieve the necessary surface and edge finish. Bear in mind that this and all subsequent steps are carried out on both sides of the platter so that it ends up with two recording surfaces. The aluminium blanks are now precision-ground using 'stones' that are composed of PVA and which contain silicon carbide as the abrasive agent. However, even with all the care taken to produce a good finish, the surfaces of the aluminium blanks produced in Step 2 are not yet nearly perfect enough. Because there's a limit to the degree of smoothness to which aluminium alloy can be ground, the next step is to apply a hard coating that will take a better finish. This hard coating is an amorphous alloy of nickel and phosphorous (NiP). It's applied by an electroless process in which complex supersaturated solutions containing compounds of nickel and phosphorous react on the surface of the disk to leave the required NiP layer. This layer can now be further refined in the next step of the process.